The Milky Way is visible from anywhere on Earth. While it makes for a lovely milk-like glow across the sky, it is also filled with gas and dust that can limit our view of certain parts of the sky. While we can map out where certain gas and dust is through the Milky Way, making an accurate map is challenging because much of it is cold and diffuse, making it difficult to observe. But with the rise of submillimeter radio astronomy, that’s changing. Cold gas and dust emits faint light in the submillimeter range, so to study this material we need good radio telescopes. Unfortunately our atmosphere (mainly water vapor) absorbs these wavelengths, so the radio telescopes need to be located in a dry region at high elevations, such as at Chajnantor plateau in northern Chile. The most famous telescope at Chajnantor is the Atacama Large Millimeter/submillimeter Array (ALMA), which is an array of about 60 antennas. But just down the way from ALMA is the Atacama Pathfinder Experiment (APEX), which has been mapping the gas and dust of our galaxy. 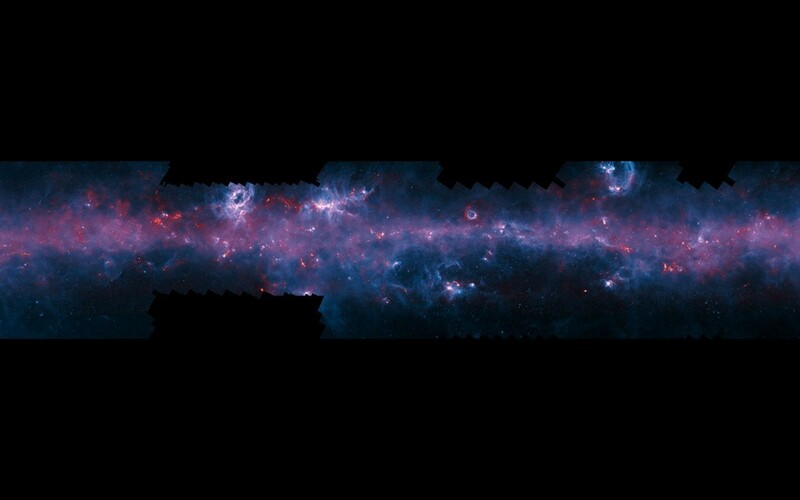 The APEX Telescope Large Area Survey of the Galaxy (ATLASGAL) has been scanning the Milky Way at submillimeter wavelengths, and has just released a full map of our galaxy. You can see one of their images above, which shows the wonderful complexity of the Milky Way, with fine tendrils of gas and dust. Creating a map such as this will not only help astronomers better understand our own galaxy, but also allow astronomers to better take the effects of our galaxy into account when looking beyond our neighborhood of stars. place for them and I thing Big Life leaving their.